This timeworn table features a black finish with subtle gold rub-through. The table's top has a carved edge below which hangs a unique scalloped apron. 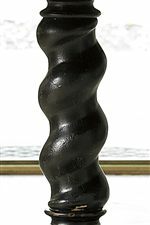 A classic barley twist pedestal supports the top and is joined to four shallow, scrollwork legs. Hardy in structure yet delicate in design, this scalloped side table is an excellent accent piece for any home. The Biltmore Scalloped Side Table with Barley Twist Pedestal by Fine Furniture Design at Alison Craig Home Furnishings in the Naples, Fort Myers, Pelican Bay, Pine Ridge, Bonita Spring, Golden Gate, Estero, Cape Coral, Marco Island, Sanibel/Captiva Island, Point Charlotte, Ave Maria, Florida area. Product availability may vary. Contact us for the most current availability on this product. Wood & Finish Bleaching Begins The Finishing Process. Bleaching Evens Out Wood Coloration And Presents A More Uniform Surface For The Finishing Process. Sanding Is The Next Step In The Finishing Process. After Sanding, The Furniture Is Placed On Wheeled Carts For Its Trip Through The Finishing Line. Removable Pieces, Like Drawers And Shelves, Ride On Their Own Carts Next To Their Case Pieces. This Arrangement Ensures That All Parts Are Well Finished And That All Case Pieces End Up With The Drawers That Were Specifically Fitted To Them. Once Furniture Reaches The Finishing Line, It Is Hand-Sprayed With Coats Of Many Different Colors. The Final Applications Of Finish Consist Of Several Clear Coats Of Cellulose Lacquer That Impart A Soft Sheen. The Final Touch Is Waxing. Then The Furniture Is Packed For Shipping. Finish & Paint Options Collection Features Fifteen Paint and Finish Options. Case Detail Hand Carvings and Intricate Moldings Grace Pieces Throughout. Drawer / Shelf Construction Drawers Are Joined At All Four Corners With English Or French Dovetails. Strong Wood Glue Forms A Bond Between The Two Pieces Of Wood That Is Actually Stronger Than Wood Alone. Together The Interlocking Dovetails And The Glue Give Enormous Strength To The Drawers. Drawer Suspension Guides Are Made From Kiln-Dried Hardwoods That Have Been Sanded and Finished. The Geometric Shape of the Drawer Guides Makes it Fit Snugly in Place. Case Construction Frames Are Square. Corners Are Joined And Aligned. Care Is Given To Construction Techniques That Insure That The Products Do Not Wobble Or Rack. Parts Are Joined With Screws, Corner Blocks, Dowels And Glue To Assist In Properly Shaped Joints. Beds Are Assembled With Bolts, Supports And Metal Brackets For Sound Construction. The Back Panel On Our Chest, Dresser Or Entertainment Centers Are Stained And Top Coated.It Is Attached To The Piece With Screws, Adding Stability To The Furniture And Preventing Racking. The Structure Of A Chest Or Dresser Is Reinforced By Inserting Wood Between The Drawers. These Pieces Of Wood, Known As Dust Proofing, Keep The Contents Of Your Drawers Clean And Add To The Structural Integrity Of The Piece. The Biltmore Collection is inspired by the gracious, comfortable furnishings found in the home of George and Edith Vanderbilt. Built in 1895, the Biltmore House features comfortable magnificence and spectacular hospitality. 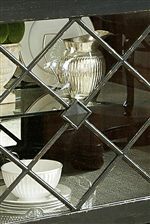 These attributes are reflected in the pieces of the Biltmore Collection. A breathtaking array of fine finishes and exclusive fabrics are used to construct furniture that is both glamorous and grounded. 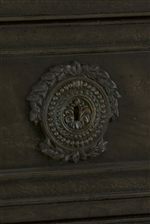 Exquisite details such as hand carvings and shaped moldings add dramatic personality. Masterfully crafted from the finest materials, the Biltmore Collection reflects a graceful, timeless style and brings a superior living experience to any home. The Biltmore collection is a great option if you are looking for Traditional furniture in the Naples, Fort Myers, Pelican Bay, Pine Ridge, Bonita Spring, Golden Gate, Estero, Cape Coral, Marco Island, Sanibel/Captiva Island, Point Charlotte, Ave Maria, Florida area. Browse other items in the Biltmore collection from Alison Craig Home Furnishings in the Naples, Fort Myers, Pelican Bay, Pine Ridge, Bonita Spring, Golden Gate, Estero, Cape Coral, Marco Island, Sanibel/Captiva Island, Point Charlotte, Ave Maria, Florida area.